I work with my clients in their homes. Since there is driving time, there needs to a 15 minute buffer between my appointments. How do I account for travel time for the clients whose homes I travel to? This can be handled in a number of ways. 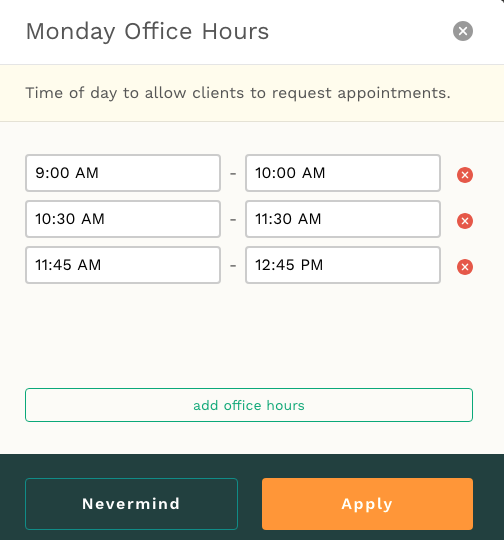 The simplest method is to schedule your appointments as you would with any other calendar. Leave open spaces between your office hours to account for travel time. You can have as many blocks of office hours in a day as you’d like. Another way is to default that client's appointment length to include the travel time and any additional per-appointment travel fees. This method ensures the client values your full time commitment to their appointment. Let us know if either of these methods won’t fit for your schedule and we can suggest some others too, just send us an email!